Jewellery is that one accessory that makes your entire ensemble classy and chic. And every woman should shine and dazzle every day! For your daily wear fashion, Manubhai Jewellers brings you, its Everyday Diamonds. 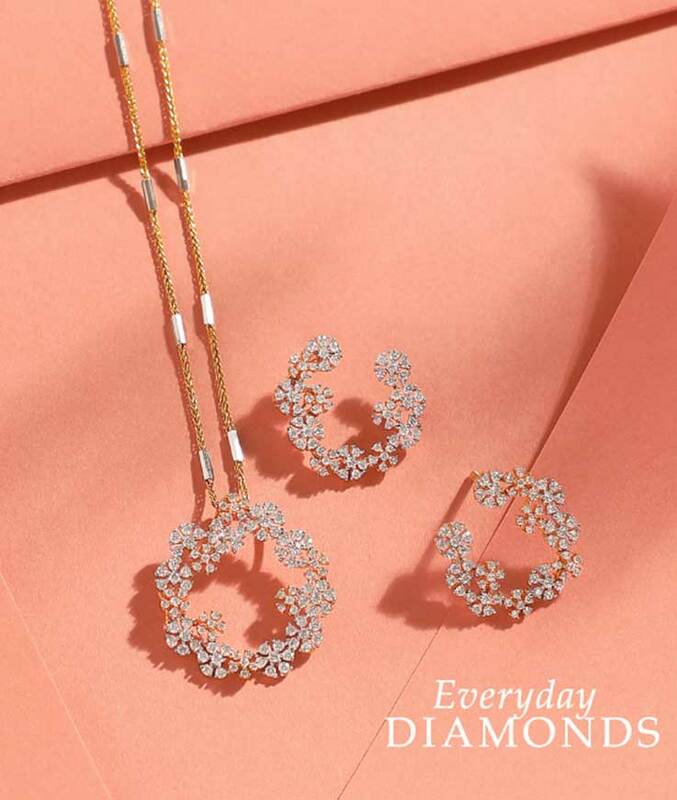 Cute floral studs, to dainty pendant sets in ornate lace patterns and rows and rows of finely cut diamonds in bracelets, the Everyday Diamonds Collection just becomes your pick. 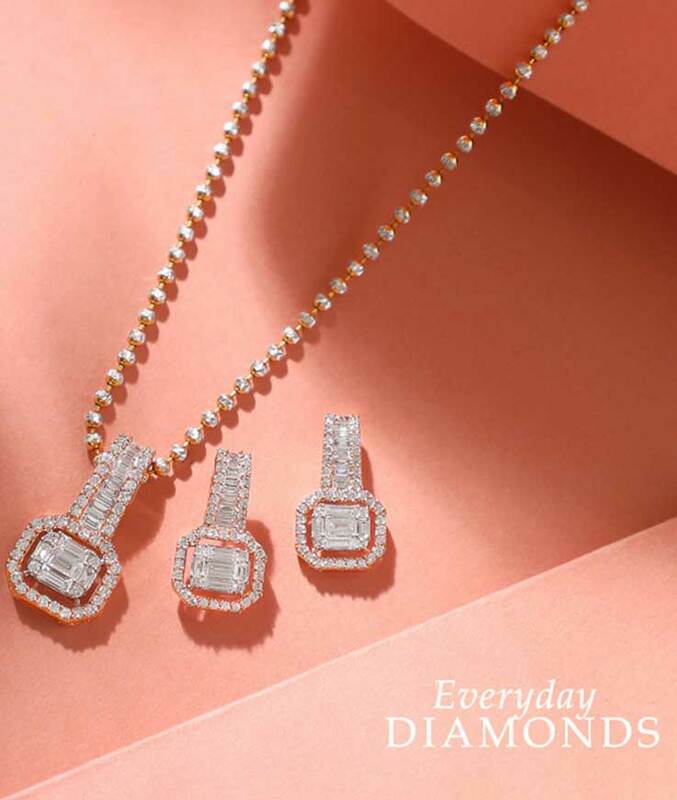 While you’re at meetings or while you’re at a party, while you’re at coffee or while you’re on vacation, the Everyday Diamonds collection offers you lightweight, fine diamond jewellery to create that stunning look. Everyday can be a Baguette Diamond Day! This beautiful diamond pendant set is crafted in 18k hallmarked white gold. Studded with VVS FG diamonds, the halo around the pendant and diamonds earrings are studded with round diamonds in a pressure setting and centre diamonds are baguette cut diamonds that brings out a contemporary feel to this diamond pendant set. Make Everyday Fresh and Flowery! This alluring Diamond Pendant Set is studded with VVS FG quality diamonds, creating a delicate floral wreath in 18k rose gold. With 1.67 carat of diamonds and each round diamond set on a 3 prong setting, the flowers look edgy with a beautiful arc, making this lightweight diamond pendant look complete for that perfect summer day. Twines of beautiful pear shaped diamonds studded together, form beautiful leaf like motifs in this daily wear diamond pendant set. Created in 18K white gold, the diamond pendant set is studded with VVS FG quality diamonds along with a silhouette of round diamonds around it to complete the look with 1.36 carats. 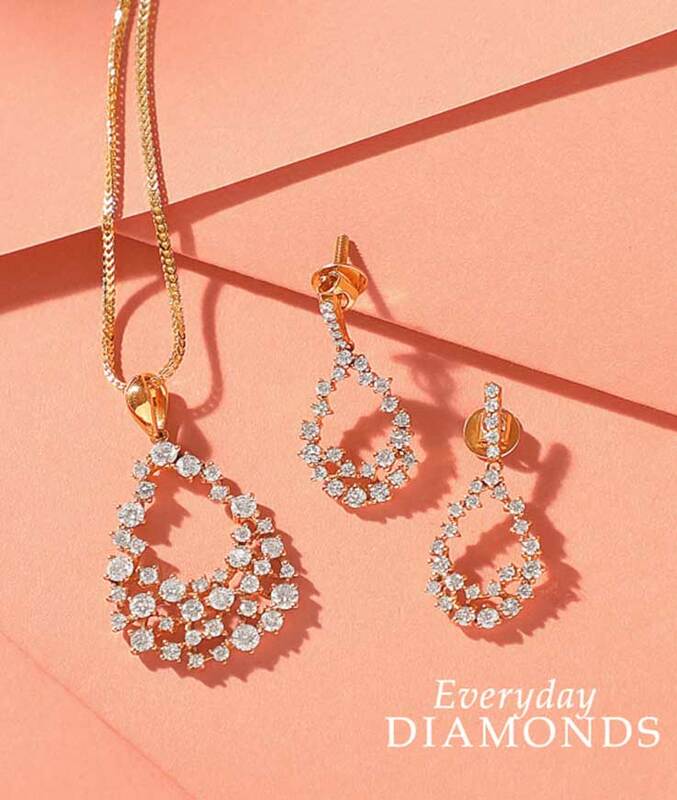 This pendant set is paired with stunning earrings to bind the set for the perfect everyday look. Bling on your fingers! 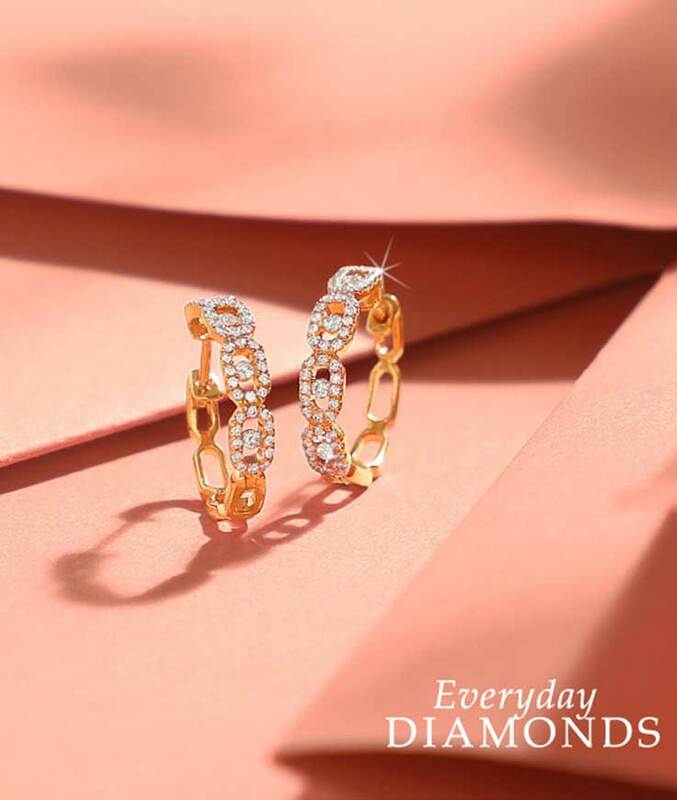 These dazzling rings are perfect for Everyday wear and are made with beautiful 18k yellow gold and white gold along with VVS FG quality diamonds, along with a line of diamonds on either sides to give it lustrous look. 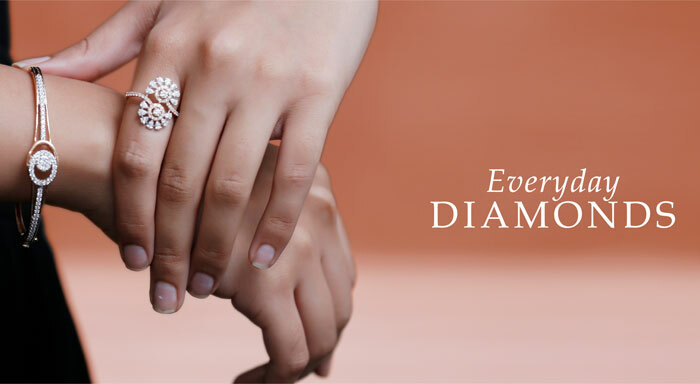 The Everyday Diamonds collection has various motifs from abstract shapes to florals. Make these beautiful diamond hoops your everyday accessory! 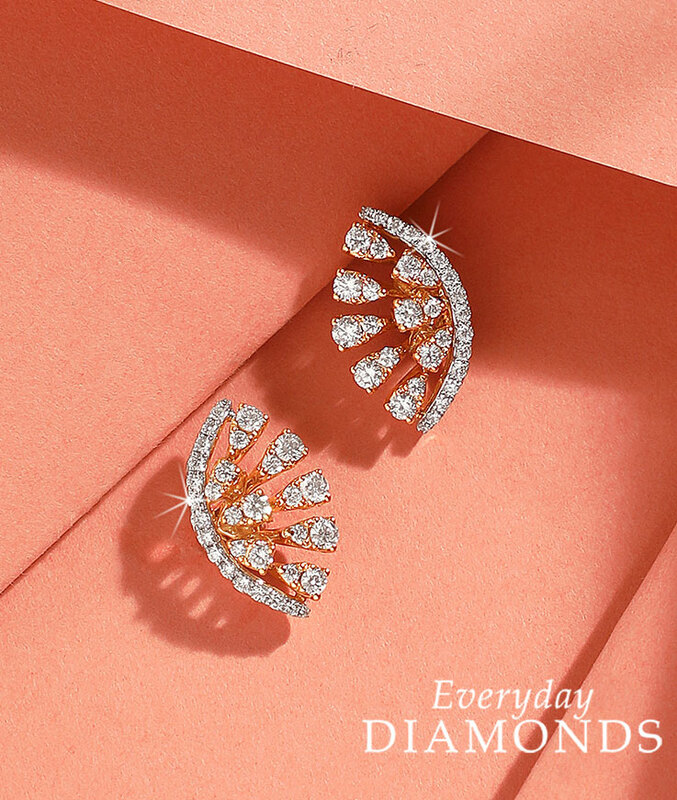 This ravishing pair of diamond earrings draw inspiration from the art deco era with round diamonds studded in an edgy design in 18k rose gold with VVS FG diamond quality. 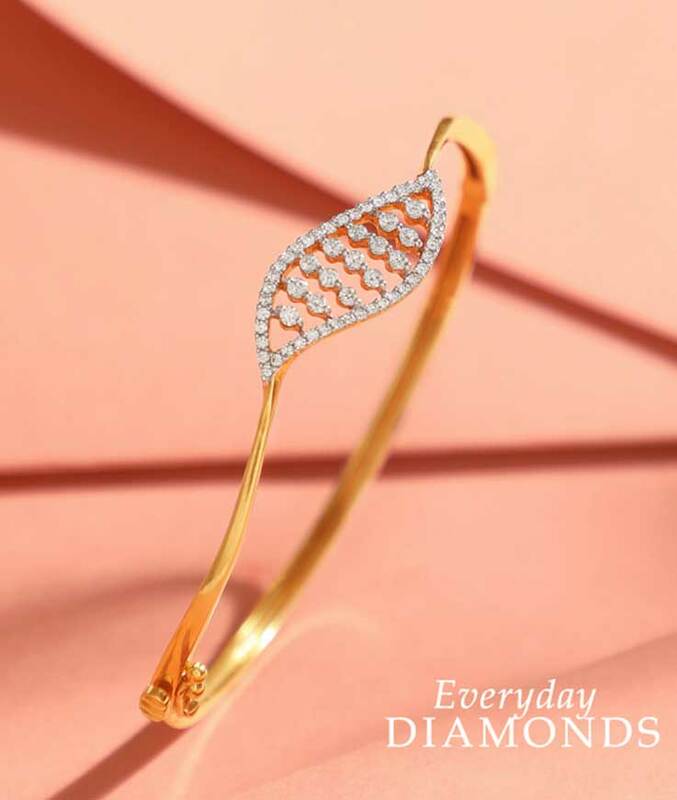 A beautiful wave of diamonds in a bracelet that add to your everyday fashion quotient. This 18K yellow gold bracelet is the perfect bling as a work wear accessory, studded with VVS FG quality diamonds with 0.61 cents, which together form a beautiful leaf like pattern. This fascinating 18k hallmarked gold pendant set is studded with VVS FG quality diamonds to give it an exquisite and classy edge to the diamond pendant set. 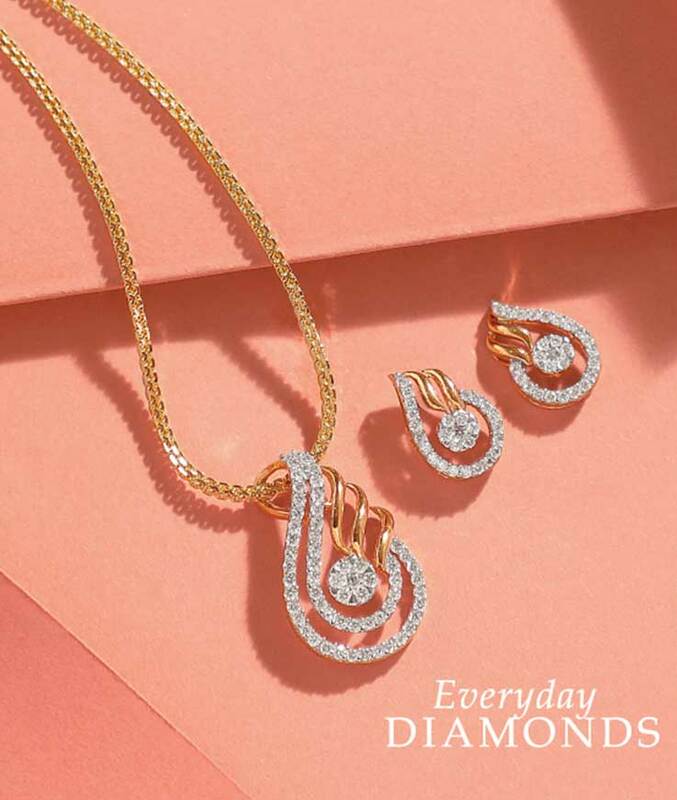 With a tear drop motif, this diamond pendant set is an ideal choice to compliment every attire. For today's women diamonds are a daily essential wear! This paisley motif diamond pendant set is created in 18k hallmarked gold and is all you need to showcase your style. 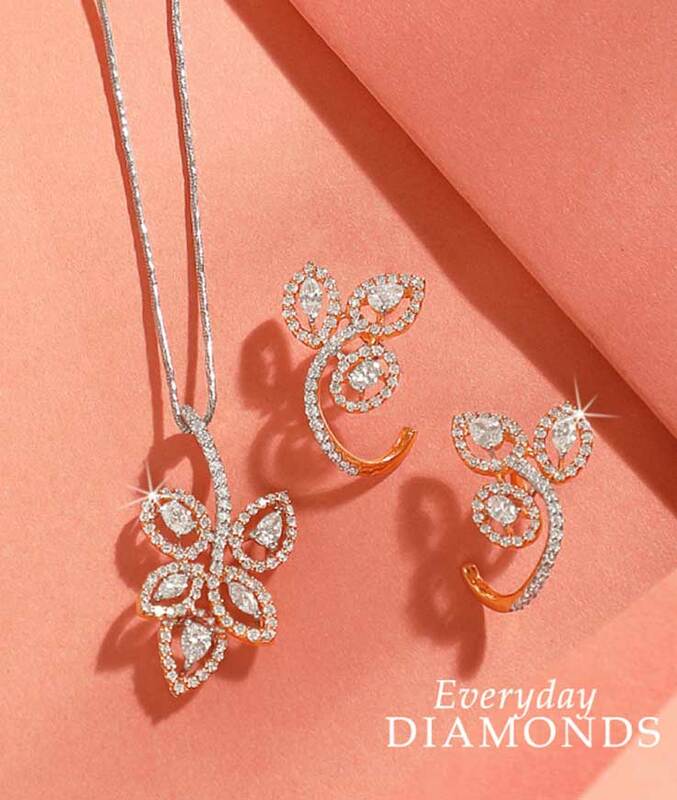 The diamond pendant along with the diamond earrings has around 0.72 cent of diamonds in VVS FG quality. The pendant and earrings are designed with a beautiful bunch of round diamonds in pressure setting in the centre. When you can't choose one, wear one diamond ring everyday! 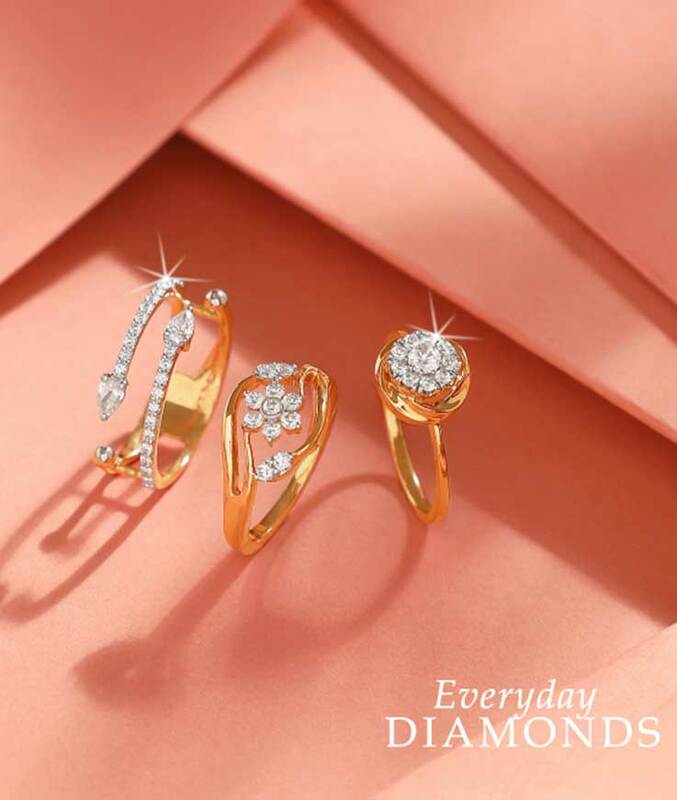 These everyday diamonds ring with 18k hallmarked gold are perfect to give you your daily dose of bling. With VVS FG diamond quality and VS GH diamond quality, these diamond rings bring out the complete look for everyday wear. 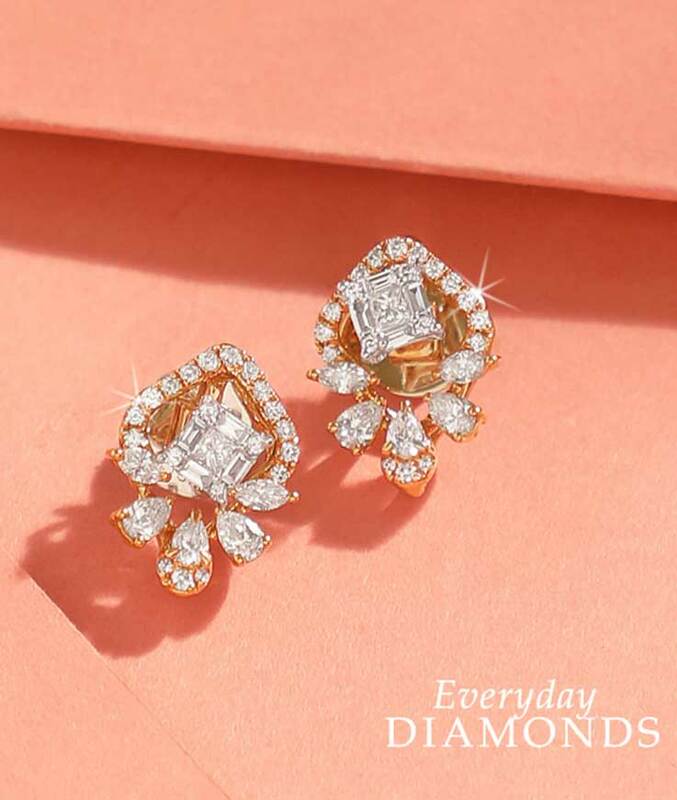 Come fall in love with our everyday diamond earrings. The dual utility of these diamond studs make this the ultimate multitasker for work wear. Crafted in 18K rose gold, these studs can be worn two ways. The central baguette diamond studs can be worn individually or complemented with the halo of diamond studded leaves. With VVS FG diamond quality and 0.82 cents these diamond studs are remarkably stunning. This glamorous pair of earrings are exquisitely designed to be the perfect style for everyday fashion. These beautiful diamond studs are designed and encrusted with rounds diamonds such that they create an illusion of pear shaped diamonds. With VVS FG quality diamonds, you can now dress up glam everyday with these diamond earrings. 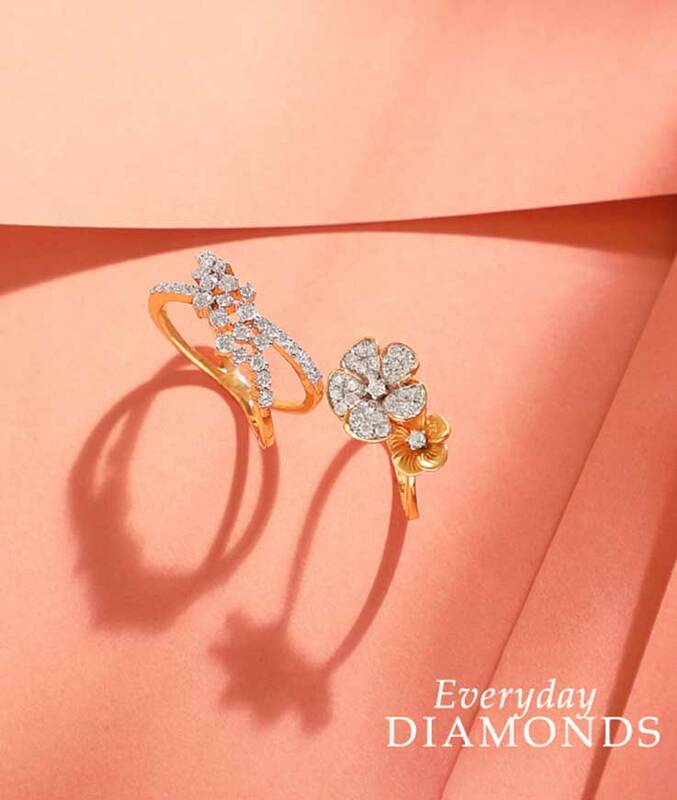 The beautiful floral motifs and intricately aligned diamonds designed on these 18k hallmarked gold rings makes these diamonds rings your daily essentials. 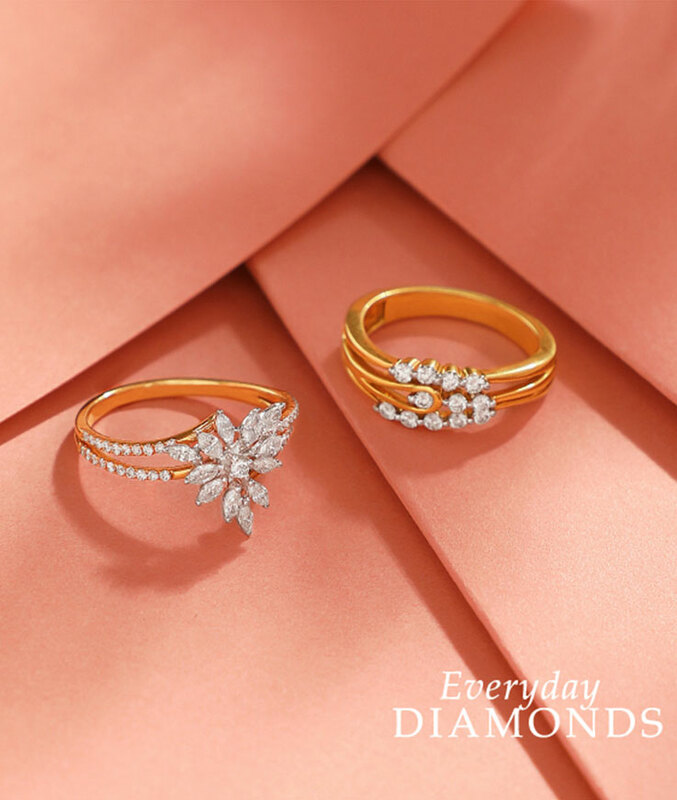 With marquise diamonds, baguette diamonds, pear shaped diamonds in the everyday diamond jewellery collections, these classic diamonds rings make everyday wear Bling!